Now we have an even better way to fill a space, day, or moment with lively color and lasting joy throughout the year. Transform a space. Brighten a day. Beautiful paper flowers for each season, reason, and occasion in your year. Choose a subscription method: recurring billing charged quarterly, or enjoy a loyalty discount when you pay for one year in full up front. 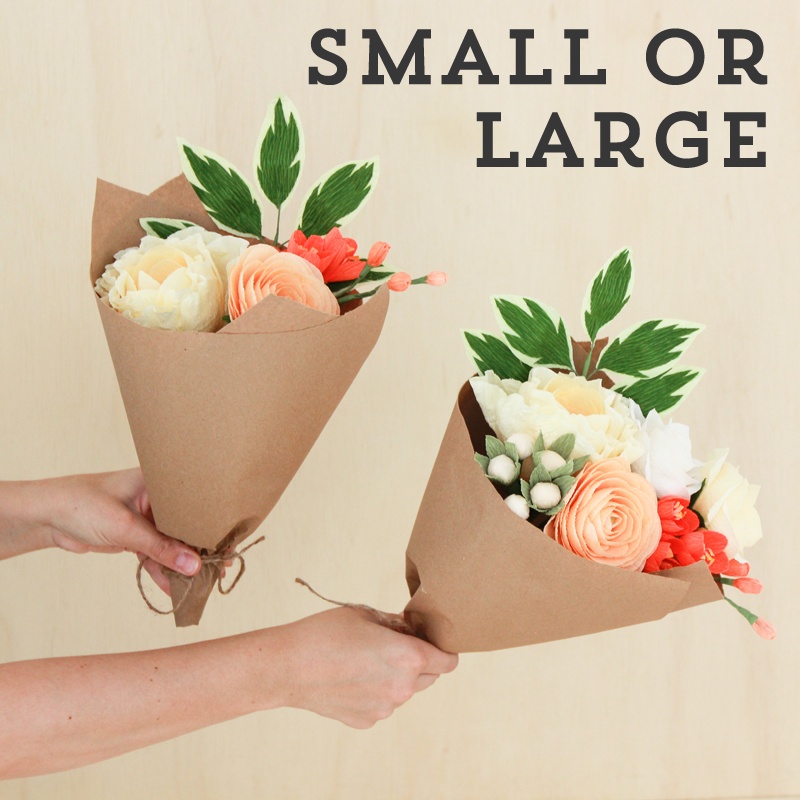 Choose a size for your subscription bouquets: Small (4 stems) or Large (7 stems). Enjoy a new bouquet each season for a year! We'll ship it arranged in a vase, along with special bonus gifts and coupons. These examples illustrate the size options. Subscriptions may not include these exact bouquet recipes. It's your year to bloom. No dirty water to change, no wilted flowers to throw away, no guessing what blooms to combine in an arrangement. Leave that to us - we'll design a unique new bouquet recipe in a seasonally appropriate color palette to send you quarterly. Because they don't die, our flowers keep giving. 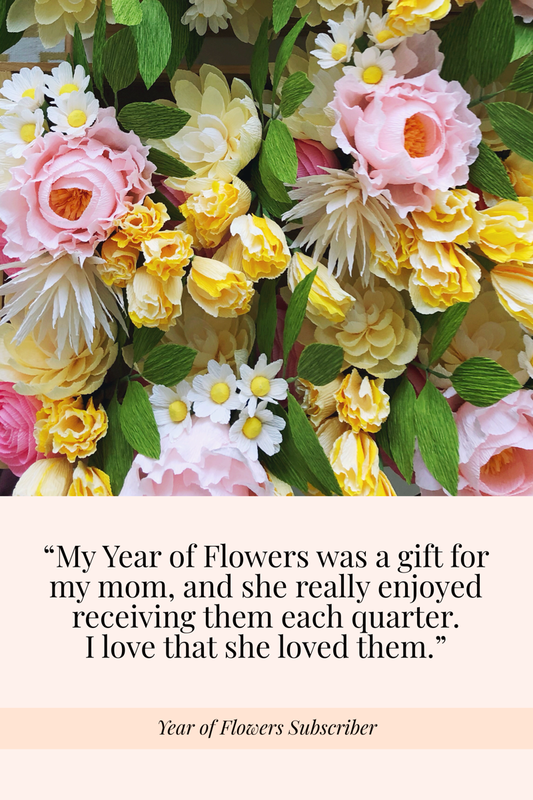 When your next bouquet arrives, you can shift your previous blooms to a new room, or surprise a loved one, colleague, client, or friend with a "just because" gift. The window to join for spring 2019 subscriptions has closed. We’ll reopen the joining window to new subscribers May 1 for summer subscriptions. Spaces are limited! Don't miss your next chance to join! Sign up to receive subscription announcements, product launches, special discounts, and paper flower love! We’ll reopen the joining window to new subscribers May 1 for summer subscriptions. These bonus items were included in each spring 2019 subscription package! Summer bonuses to be announced soon. Arin at True Cotton is such a light and inspiration — and so are her airy, breathtaking designs. 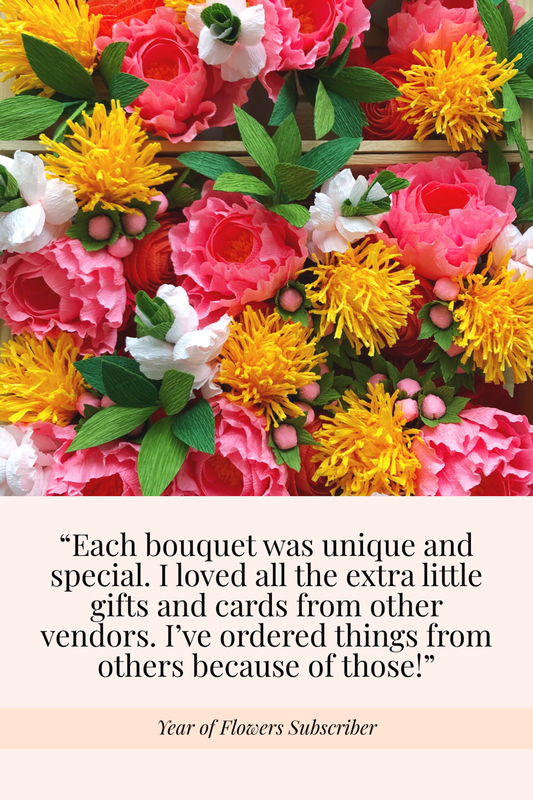 We think you’ll love her floral paintings and hand-lettered quotes and verses. AND she designed this tea towel ESPECIALLY for us (um, how cool is that?). Floret is a family-run flower farm in Washington, specializing in growing unique, uncommon, and heirloom flowers. That’s right, LIVE flowers. We hope you’ll enjoy planting their globe amaranth seeds —our namesake and the bloom that means “immortal" in the language of flowers. Whenever we can, we try to source an extra special vase option beyond our regularly offered white bottles. These tapered vases are each unique with pewter and cream colors and a textured finish. They almost look like birch bark and set off our cheery pastel spring blooms perfectly! PLUS BONUS COUPONS from other awesome artists! These images show examples of our Winter, Spring, Summer, and Fall color palettes. Specific blooms, colors, and recipes change each year. Subscription payments (whether in-full or recurring) are non-refundable. If you have opted for recurring billing, you may cancel mid-year. But we hope you'll stay! Please email us if there's something we can try to do to make your experience better! That said, if you decide to go, just be sure to cancel before your next scheduled charge, as subscription payments are non-refundable. If you opted for recurring billing, you may manage your account (payments, shipping address, etc.) via the MoonClerk customer portal. Check your sign-up confirmation email for that link. Local pick-up is not available for subscription orders. After your Year of Flowers has completed, you will have the opportunity to renew but you will not be automatically re-subscribed without your permission. It is a one-year subscription. Please refer to our Shop Policies for additional information.